Here’s the picture that shows you why Nathan Cleary is something extra special. Captured by the Weekender on Tuesday, this photo is taken well after training had concluded. As rain pours and the rest of the squad gets showered and heads home for the day, Cleary remains out on the fields of the Academy. Alone, his concentration is only broken by James Maloney jokingly barking at him to “go home” as the rain continues to fall. It’s evidence of the pure determination Cleary has and sums up why he’s so important to Penrith. He goes the extra mile. Always has, always will. Penrith are very keen to extend the contract of rampaging forward Reagan Campbell-Gillard. The 24-year-old is about to enter the prime of his career and is off-contract at the end of next season. The Panthers are hopeful of re-signing the Australian Test star for at least another two years prior to November this year when he can be officially approached by other clubs. RCG recently rubbished rumours that he was looking to move on from Penrith. Labor is desperately trying to push a silly story suggesting that Penrith home games may be at risk as part of the State Government’s stadium plan. Londonderry MP Prue Car, Candidate for Penrith Karen McKeown and Shadow Sports Minister Lynda Voltz even took an angry photo outside Panthers Stadium, calling on Penrith MP and Sports Minister Stuart Ayres to “come clean” on which suburban grounds would lose games to ensure enough content filled the new-look Parramatta, Allianz and ANZ Stadiums. This #fakenews story would make Donald Trump proud. The Panthers have absolutely no intention of moving any games away from Penrith outside of the match they play in Bathurst each year. And I can tell you the State Government hasn’t even approached Panthers management about moving games to Parramatta Stadium when it re-opens next year. If they do, they’ll be met with a resounding “no thanks”. Most of the new game day initiatives at Panthers Stadium were a hit last Sunday, particularly the ‘stand up, flags up’ concept, which was certainly a wonderful sight. The jury is still out on the dual hosting concept, with Scott McRae now joined by Natalie Sinclair to guide the match day proceedings. It didn’t flow all that well and almost didn’t seem needed – but let’s give it a few weeks to settle in. Here’s a quirky stat for you – James Maloney has never lost at Panthers Stadium. As a player at the Warriors, Cronulla and Roosters, Maloney always walked away victorious, and now he’s added a win in Penrith colours. The Panthers will be hoping his sensational record at the foot of the Mountains continues well into the season. Panthers boss Phil Gould has revealed he wrote a passionate letter to the NRL pleading with them to give wayward youngster James Roberts a start at the Gold Coast in 2014. Speaking on ‘100% Footy’, Gould revealed the troubled Roberts had worn out his welcome with Penrith’s coaching staff back in 2013-14. But Gould was so attached to ensuring Roberts kept his life on track that he pleaded with the NRL to ensure the Titans move could happen. In the end, after a short stint with the Titans Roberts ended up at the Broncos where he appears to finally be maturing under coach Wayne Bennett. Nathan Cleary will appear on ‘Sunday Night With Matty Johns’ this Sunday night on Fox League. Nothing too unusual about that, except that his father and Wests Tigers coach Ivan Cleary is also on the guest list for the night. We presume they’ll car pool into the studio. A new car park is set to open at Panthers Leagues Club on April 10 – providing some additional relief on busy match days. If the below photo doesn’t sum up the modern day footballer, I don’t know what does. 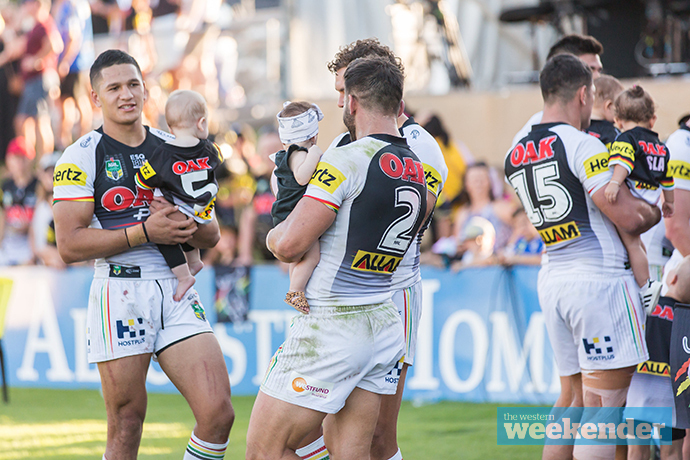 After Sunday’s win against the Eels, the new fathers in the Penrith camp found themselves nursing their babies on the touchline – a scene you probably wouldn’t have spotted 10 or 20 years ago. The Bulldogs may be known as the family club but the Panthers aren’t far behind these days.